Who would have imagined a wedding would have so many loose ends? And there’s still a lot to do!Â Hotel and rental car for the honeymoon, finalizing the wedding ceremony (including writing the wedding vows! ), writing the wedding program, tallying RSVPs and following up with people who haven’t yet replied, reading through Vancouver guidebooks, arranging childcare for people who need it…the list goes on and on.Â Unbelievable. Fortunately, we do still have a month to the wedding, and it’s not unmanageable – being a project manager by profession, I’m naturally pretty organized.Â I’m tempted to make up a schedule in Microsoft Project, but I think that would be overkill – so I’m doing a set of checklists for pre-wedding preparation instead.Â I think that will help avoid drama the week before the wedding. 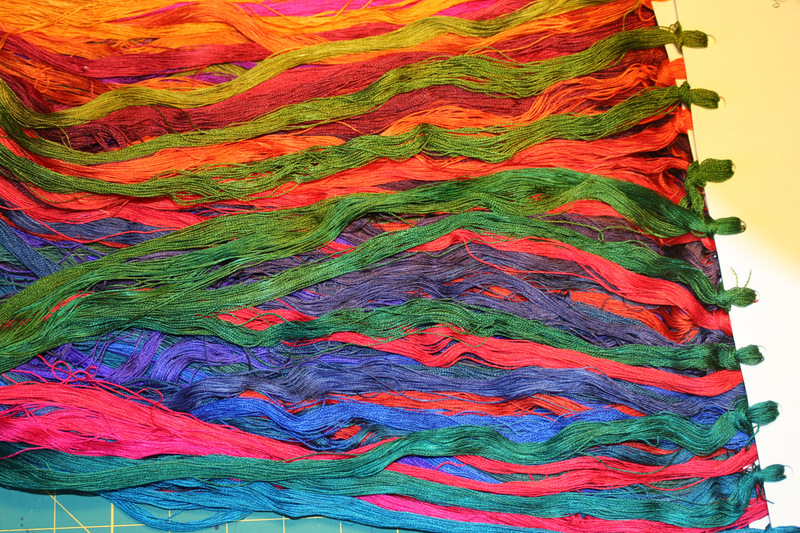 At any rate, despite the pre-wedding whirlwind, I have not been entirely idle fiber-wise – I finished dyeing another 44 skeins in the last few days, and will do more soon.Â I’m also starting my study of tapestry on Saturday, with Christine Laffer, a tapestry artist in San Jose.Â She and I had a preliminary meeting last weekend, and as I suspected, there’s a LOT more to tapestry than was covered (or even hinted at) in the book I was reading.Â So I’ll be delighted to start working with tapestry. 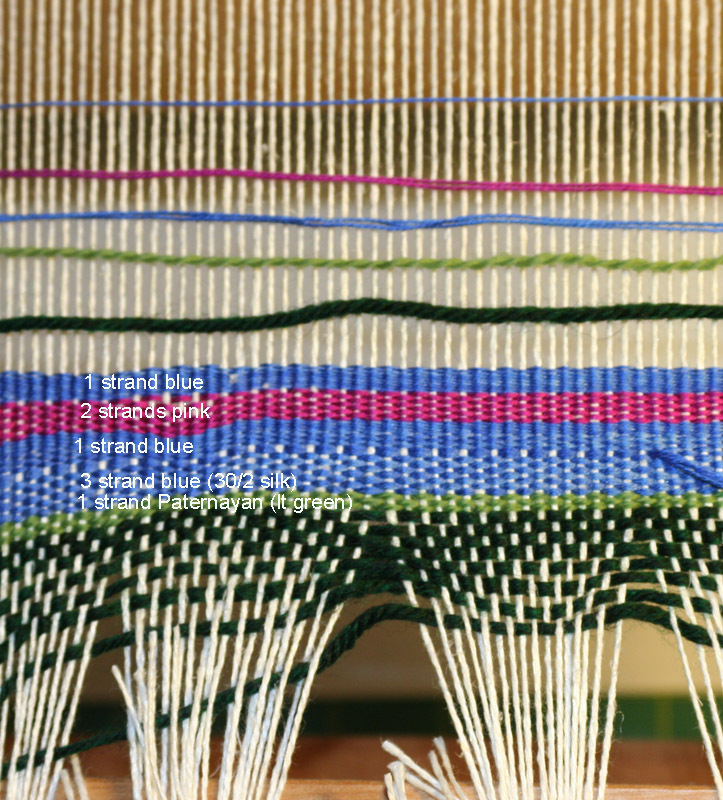 Yesterday I set up my table loom for tapestry weaving.Â It was an interesting experience – it’s been months since I set up a loom for back-to-front warping on a plain beam (normally I use my sectional beam), and I botched the winding-on badly at the beginning, so instead of a cylinder I had a cone-shaped warp.Â I had to wind it all off and re-beam, thankfully with better results this time.Â Fortunately, on a 90-thread, 3-yard warp, that took only a few moments!Â After weaving with 1500+ thread, 20-yard warps, it was amazingly fast. Anyway, I didn’t have what is apparently standard tapestry warp (8/3 or 8/4 linen is what was recommended by the folks on Weavolution), nor did I have the recommended tapestry yarn.Â What to do? 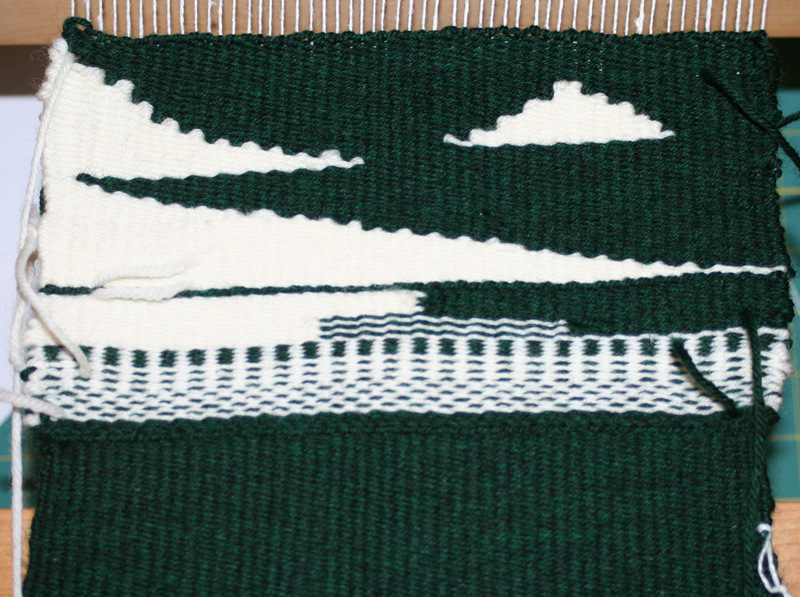 Well, I figured that people weave tapestry with all sorts of yarns, so it was probably just a matter of finding the right warp and the right sett.Â So I took out my 10/2 linen (the heaviest cotton or linen yarn I own), did my wraps per inch, and warped up at the theoretically optimal sett of 10 epi. I promptly discovered that sportweight was waaaaay too thick!Â I tried several options, and finally got good warp coverage (tapestry is a weft-faced weave) with a single strand of 30/2 silk.Â This is pretty, but would take FOREVER to weave a sample, so I think I may try to open up the sett somewhat (fewer warp ends per inch) and weave a sample with slightly heavier yarn.Â But first I will order somewhat larger warp yarns, so I can use heavier weft yarns in my samples!